It is estimated that approximately half the population experiences tooth sensitivity. 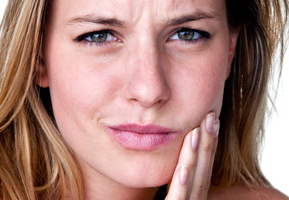 Tooth sensitivity can range from very mild to extreme and can come and go over time. There are many things that can cause sensitive teeth, and treatment can vary depending on the cause. You may experience sensitivity when you drink something cold, when you bite down on something, when you eat something sweet or even when you drink something hot. The sensitivity you experience may be mild and momentary, or extreme and last for hours. So what’s going on? Why do your teeth react to hot, cold, sweet, or sour, and sometimes even to pressure? Having sensitive teeth may be an indication of a dental problem that needs treatment. It should therefore be used as a big hint to visit the dentist! The first step in treating sensitive teeth is to determine the cause. Teeth can become sensitive for many different reasons ranging from trauma to dental disease. A dentist will examine the teeth and try to determine the cause. 1) Dental trauma – a tooth can be sensitive to even slight pressure if it has been traumatized in any way, “bruised” or even cracked (by biting down on something). Sometimes even having your teeth cleaned or a filling done can cause sensitivity. Sensitivity to trauma can takes weeks or even months to go away. If a tooth is cracked, the sensitivity will likely not resolve and further treatment is required. If you have recently had a filling done and your tooth is sensitive ask yourself – does it feel like you are hitting on that tooth first when you close. If the answer is yes, you will need to return to the dentist to have the filling adjusted. When you are “frozen” it is hard for you to bite down as you normally would. This can result in the filling be a little “high”. Once the freezing comes out, and you begin to bite normally, you may be hitting on that tooth before contact is made with your other teeth. This can traumatize the tooth and the sensitivity can be quite noticeable. A bite adjustment will correct the problem. If the tooth had a large or deep filling done – the nerve of the tooth may be irritated and just take time to settle down. (That is why it is always preferable to detect cavities when they are small!) If a tooth has just been bruised by biting on something hard like a popcorn kernel – it may just take time to settle down, or the tooth may be cracked. If after a few weeks you are still experiencing sensitivity, call us. 2) Uneven bite – If a tooth or teeth are hitting too soon or too hard because the teeth have shifted, and your bite has changed, it can cause sensitivity. These shifts can be due to things such as thumb sucking, or loss of bone structure, a tooth being extracted and the other teeth shifting into the empty space etc. Again a bite adjustment usually corrects the problem. 3) Dental Decay – if a tooth is decayed, bacteria have access to the nerve of the tooth and the tooth often becomes sensitive to hot or cold, sweets, or acidic food. Removal of the decay and a filling is required to solve this issue. 4) Dental infection – If there is infection in the tooth, the sensitivity can be extreme. Treatment is needed to clear up the infection or it can not only lead to extreme pain, but serious health issues. 5) Dentinal Sensitivity – by far the most common cause of tooth sensitivity is exposed dentin. Dentinal sensitivity occurs when the dentin (the inner layer of a tooth) is exposed. People with a healthy, thick layer of enamel on their teeth don’t usually suffer with tooth sensitivity. However, the thickness of enamel varies from person to person, and enamel can be eroded by various things. Dentin is a sponge-like material containing small tubes that connect the root canal space (pulp) to the outside of the dentin. If the enamel on the tooth is compromised the dentin can be exposed, resulting in sensitivity. A) Poor oral hygiene. This can lead to cavities, and/or plaque and tartar build-up, resulting in gum recession. B) Gum recession/gum disease. 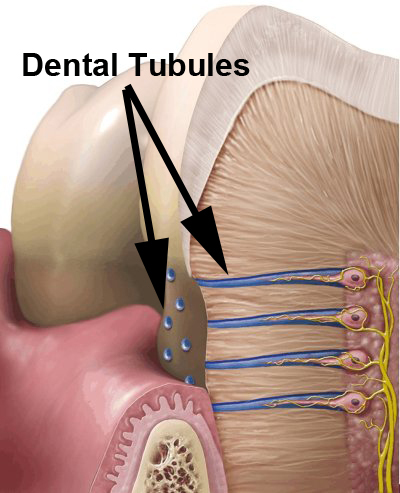 This can occur naturally over time, whereby the gums shrink back exposing root dentin which is not protected by enamel. C) Over-brushing or aggressive brushing. 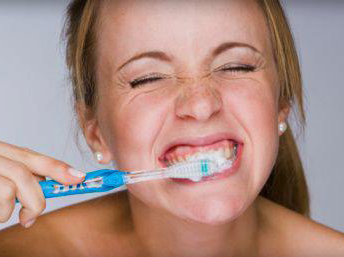 If you brush too forcefully, with a side-to side technique or with too hard a brush, the enamel may be thinned. The area around the gum-line is most often affected. D) Acidic food. 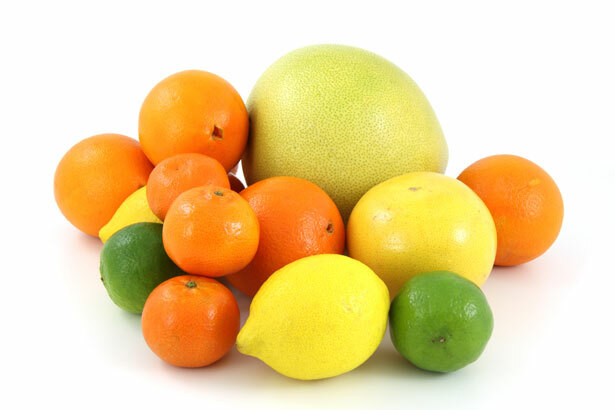 Regular consumption of food with high acid content, such as citrus fruits, tomatoes, pickles and tea, can cause enamel erosion. E) Grinding. Similar to erosion, regular teeth grinding (also called bruxism) can wear away the enamel by physically grinding it away. This may also cause ‘aching’ teeth, due to constant pressure on them. F) Teeth whitening. Sensitivity is one of the common side effects of whitening. This usually clears up soon after the whitening has ended. Sometimes it means slowing down the whitening process or being proactive with other preventive steps before you whiten. H) Medical conditions. For example, bulimia and acid reflux (GERD) can cause acid to collect in the mouth and erode enamel, resulting in sensitive teeth. G) Bad habits. Using teeth as tools or chewing on objects (e.g., pens) can wear away tooth enamel as well. Join our next blog for treatment options for sensitive teeth! This entry was posted in It's Your Health, Oral Health and Overall Health, Oral Hygiene, Other Tips, Prevention, Sensitive Teeth and tagged acidic food, causes of sensitive teeth, dentinal sensitivity, gum recession, sensitive teeth, senstive teeth, whitening. Bookmark the permalink.